The property is spacious. It boasts a stunning beamed living room with three comfy settees and large woodburner, which makes for cosy winter evenings; spring and summer visitors can relax with a glass of wine in the conservatory, overlooking the garden and the owner's surrounding fields and watch the evening forays of the barn owl across the field. The large master bedroom offers a king-size bed, TV and en suite, whilst the second bedroom has two comfortable 3ft divan beds. Free Wifi is provided. Children and dogs are welcome at Swallow Barn. A cot option in the main bedroom is available on request, as well as a baby chair. Dogs are safely contained in the garden by a surrounding post and rail fence, netted to the top, and gated to the road. The pine staircase seen in the photos leads to the owner's storage area, and is gated at the bottom to prevent children accessing it. The property offers gas central heating throughout, which makes it inviting and comfortable to stay in. Swallow Barn offers peace and privacy in its private garden setting, where abundant wildlife includes swallows and pipistrelle bats. It is located 6 miles from the Georgian town of Holt, with its excellent range of shops and restaurants. The many quiet lanes and off-road tracks are ideal for cycling and walking, while bird watchers will enjoy the local Raptor Point, Pensthorpe Nature Reserve and the Blakeney and Cley marshes. Blickling Hall and Felbrigg Hall – both National Trust properties – are about 20 minutes distance. Explore the North Norfolk Coast, with its clean, sandy beaches, as well as the Norfolk Broads and Norwich (30 mins), with its castle, theatres, shops and nightlife. Within 3 miles you will find an excellent family-run butchery, 2 open-late general stores, scrumptious bakery (resist if you can! ), 2 takeaways and good pub food. I am a retired school teacher, and live just across the field from Swallow Barn with my two dogs - Pippa, a very friendly Jack Russell, and Harley, a rescued border terrier - and my retired horse, Sunny, and his piebald pal, Diamond. Being so close to the holiday accommodation means I am always on hand if help or information is needed. Swallow Barn is sited on a 4 acre smallholding, just a three minute walk from my own farm house and its one-bedroomed holiday annexe, Garden Cottage, which can be rented separately or in conjunction with Swallow Barn. I bought the land in 1987, and could not believe my luck in finding such an idyllic place to live. Prior to its conversion Swallow Barn provided stabling for my twelve horses and ponies, who worked hard during the summer months to give horse-mad teenagers fun riding holidays. In 1999 I moved the horses to stabling nearer my house, and the conversion to a characterful cottage was effected. The swallows, who nested each summer in the barn, chose to follow their equine friends to their new quarters rather than compete with the builders, but they continue to keep it under close surveillance - hence the name Swallow Barn. Sheltered from the noise and bustle of the North Norfolk tourist areas, Swallow Barn and Garden Cottage make excellent bases for accessing numerous places of interest and enjoyment within a half hour journey, from Sheringham to Norwich, from Blakeney to the Norfolk Broads, and with a great deal in between. There are numerous public footpaths, - ideal for dog walkers - cycle tracks and quiet lanes, and the whole area is a gem for bird and nature lovers of all kinds. It would be hard to find more peaceful and private holiday homes. They are separated from each other by two fields and a quiet back lane, each with their own totally private gardens and disturbed only by a barn owl or two, a few neighbouring sheep and some pipistrelle bats. What could be more pleasant than to relax in this tranquil setting at the end of an exhausting day? Family bathroom with WC, washbasin and bath with electric shower over. En-suite to Bedroom 1 with shower, WC and washbasin. All duvets, pillows and bed linen is provided. Stunning large room with beamed and vaulted ceiling. 2 and 3-seater leather settees, 4-foot sofa bed (sleeps 2), desk, occasional tables, widescreen LED TV with Freeview and DVD. Electric fan oven, gas hob, dishwasher, washing machine, large fridge/freezer, combination microwave, ironing board, iron, breakfast bar with 2 bar stools. Open-plan dining area with table and 6 chairs, opening into sunny conservatory and access to patio. Patio area with dining table and 6 chairs. Garden chairs, sun-loungers and BBQ also provided. There are golf courses at Fakenham, Sheringham, Taverham and Norwich, all within 15 to 30 minutes distance. All accommodation is based on the ground floor with two shallow steps up to the master bedroom. The staircase shown in the photos is for owner access only and is restricted by a child safety gate at the bottom. Entrance to Swallow Barn is via a bark pathway leading into the conservatory; a ramp can be placed to allow wheelchair access to the living room via the patio. Please contact us prior to booking if there are mobility issues so that we can ensure that we are able to meet your needs. Notes on accommodation: Free internet access is provided. 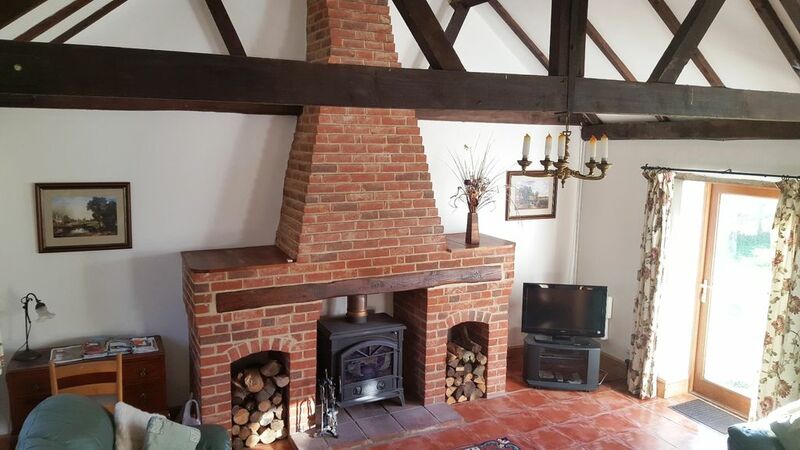 Swallow Barn is heated by a woodburner (logs supplied) and gas central heating. A Freeview TV and DVD player is provided in the living room and there is a further TV in the master bedroom. Bed linen and towels are provided. Ample garden furniture and BBQ are provided. Twin gates provide off-road for 2+ cars. Dogs are very welcome, providing they don't climb on the furniture! The garden is totally enclosed with chicken wire on post and rail fencing and gated to the road, and should contain even the smallest of dogs! There is a lockable shed for bike storage which also houses sunloungers and BBQ accessories. Swallow Barn is a non-smoking cottage. Please see separate information for Garden Cottage - 150 yds distance - which can be rented in conjunction with Swallow Barn at a reduced combined cost. Outside: Swallow Barn has lawned gardens which overlook fields. There is a patio area outside the conservatory with table, chairs and barbecue. Off-road car parking for 2 cars or more is provided as well as a lockable shed for bike storage. The garden at Swallow Barn is in full sunshine throughout the day, weather permitting, and benefits from some spectacular sunsets and frequent sightings of the barn owl who resides in an adjacent farm building. Cleaning / Towels / Linen / Maid service: Towels and bed linen are provided, and these are changed weekly for holidays extending to two weeks. Other: South-facing conservatory furnished with arm chairs and occasional tables and with an additional dining table. View overlooks the garden and fields. A comfortable cottage in a lovely and very quiet location. Perfect garden for our dog with secure fencing all round, although the resident pheasants took it in turns to wind him up! Val gave us a very warm welcome. We were very lucky with a week of good dry weather. Small point but other tall people may appreciate that there is a sheet on bed in addition to duvet, feet stick out end when no sheet. Please keep doing the this Val. We have already booked for a return visit next year. Thank you for taking time to write a such a nice review. It was lovely meeting you both and your lovely dog Archie and I'm so pleased you want to come back. I'm not sure how I can rectify the bed issue - it's a standard 6'6" length king-size divan and duvet, and I put a top sheet as well as a bottom one as many people like to sleep between sheets, but visitors are welcome to remove the top sheet if they like. Perhaps we could discuss what I can do before your next visit as I'm anxious to maximise your holiday comfort! Very nice stay, very comfortable, particularly the beds. Very peaceful, great garden for the dogs. Val was very pleasant and helpful. Thank you for taking the time to write a review. It was lovely meeting you and your dogs, and I'm glad you were comfortable and enjoyed your stay. I look forward to seeing you again in the future. We enjoyed our stay, we were made very welcome by Val. We were warm although the weather turned cold outside. Thank you for your review James. It was lovely meeting you and your family, and I'm glad you enjoyed your Christmas holiday. A very comfortable place, with plenty of settees and outdoor seating. Very convenient for visiting many local places. Thank you for taking the time to write a review and I'm very glad Swallow Barn suited your requirements. We had a great week the weather was perfect did some lovely walks with the dogs which included some lovely pub lunches. The steaks we got from the local butchers for the B B Q were really good value. Really enjoyed our stay at swallow barn. Great enclosed garden for the kids to play and dogs if you have one. Facilities inside the cottage are very good. The beds are extremely comfy and val even put a kiddy bed in our room for the youngest. Very spacious. Great for barbecues if the weather is nice. Lovely countryside to walk in the evening and spot all the wildlife. We will definitely be booking again at some point in the future. Thank you for taking time to write a review. It's great when guests appreciate the wildlife in the garden and surrounding fields and lanes, as well as the Barn itself. It was lovely meeting you and your family and I look forward to welcoming you all again in the future! This area lends itself particularly to those interested in bird watching, walking or cycling in an environment whose wildlife and scenery is ever-changing with the seasons. The area will also be of interest to those who enjoy visiting National Trust properties or travelling on steam trains. Sheringham's sandy beach is a 20 minutes drive, Cromer is a further 4 miles, whilst the vast sandy beaches and dunes at Wells-Next-The-Sea and Holkham are approximately 30 minutes distance. Blakeney, also a 30 minute drive, is ideal for sailing, and crabbing at Morston - a further 5 minutes along the coast - can be good fun for children. Norwich airport is approximately 19 miles distant. The North Norfolk steam railway can be accessed at Holt and Sheringham, and the Bure Valley narrow gauge steam railway is a 15 minute drive at Aylsham. Wells Next the Sea has a small gauge railway taking holiday-makers from the town to the beach - children love this! Regular bus services run to Norwich, King's Lynn, Sheringham and Cromer. Due to the rural location of the cottage, a car or bike is essential. The nearest village, with shops, post office and pub is 2 miles. The Georgian town of Holt, with its excellent range of shops and restaurants is 6 miles, whilst Fakenham, with its weekly market and auction, is 9 miles. Blickling Hall, the National Trust house famed for its association with Anne Boleyn, is also 9 miles distance, whilst Norwich with its wealth of history, shops, restaurants and theatres is about 20 miles and Wroxham and the Norfolk Broads are about 23 miles. Regular farmers' markets, individual farm shops and furniture auctions are to be found locally. There are several dog-friendly pubs in the area; one such pub less than 3 miles distance prides itself on its home-made (and delicious) food, and there are many other good restaurants in the area. Golf and fishing facilities are nearby. Popular activities include taking a boat trip from Morston to see the seals or hiring a boat from Wroxham to explore the Norfolk Broads. Children love the sandy beaches and nearby steam railways, as well as visiting the Dinosaur Park and Bewilderwood. In addition, Pleasurewood Hills and the Yarmouth Pleasure Beach can make an enjoyable day trip. Crabbing at Blakeney, Morston and Cromer Pier are great fun too. Norwich is a 30 minute drive and can cater for all tastes. Its historic buildings, museums, theatres, shops and restaurants can fill any dull or rainy days. To the west, Sandringham House and its gardens are certainly worth a visit, as is Castle Acre, one of the largest and best preserved monastic sites in England dating back to 1090, lying 4 miles north of Swaffham. Felbrigg, Oxburgh and Blickling Halls are all local National Trust properties and are definitely worth a visit, as is Sheringham Park with its dog-friendly walks and amazing sea views. Holkham Hall is about 30 minutes away; it is a privately owned, magnificant building - a member of the Historic Houses Association, and both the Hall and its gardens, as well as the Children's Woodland Adventure play area, are a 'must see'. Booking Notes: ****************Short-stay breaks are available out of season. These should preferably sit between two consecutive Saturdays (ie not Fri, Sat, Sun). Please contact the owner for further details*************** Please contact the owner in the first instance by email or phone, when individual needs can be discussed. A booking form will be emailed to you which should completed and returned, together with a deposit of 20% of the total cost; this can be made by cheque or direct bank transfer. The balance of the cost of your holiday will become due four weeks prior to your arrival date. On receipt of this further information, including local directions, will be sent. Changeover Day: Saturday is the preferred changeover day, but this can be flexible out of high season. Notes on prices: LAST-MINUTE DEALS MAY BE SUBJECT TO DISCOUNT - please contact us. Short-stay breaks are available throughout the year outside school holidays. Please contact the owner for details.